The author is the communication specialist for the National Alfalfa Forage Alliance. 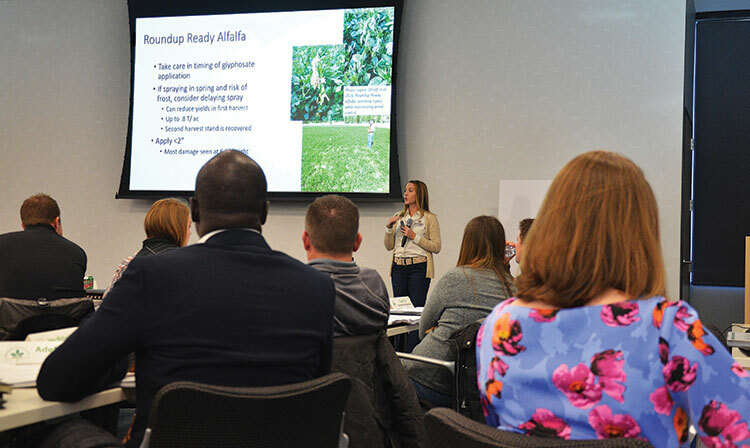 Experiencing the National Alfalfa & Forage Alliance’s (NAFA) Alfalfa Intensive Training Seminar (AITS) is like “drinking out of a fire hose; there is a lot of information in a short period of time,” said Emily Meccage, Montana State University Extension forage specialist. Seven years ago, as a forage research graduate student, Meccage eagerly absorbed the in-depth AITS training on all aspects of growing, managing, harvesting, and feeding alfalfa. This past November, she attended the two-day seminar on the other side of the podium — as an instructor. “I can’t stress enough the value of this training for consultants, whether you’re in seed sales or an agronomist or a graduate student in agronomy,” Meccage said. “It’s fairly inexpensive, plus you have access to instructors . . . to ask questions and get a good grasp of the basics of alfalfa production,” she added. Individual sessions within the training cover genetics; pest management; soils, fertility and manure management; seed and seed production; cutting management; hay and silage preservation; and other topics. AITS’ initial objective was to give seed dealers a background in alfalfa that seed companies felt was lacking, remembered Dan Undersander, University of Wisconsin Extension emeritus forage specialist. “Now, attendees also include farm machinery sales people, large-operation farmers, nutritionists, and people from other disciplines, like plant breeding,” he said. In 1993, Undersander and three other state extension forage specialists at the time — Garry Lacefield, University of Kentucky; Neal Martin, University of Minnesota; and Marvin Hall, Pennsylvania State University — launched the first seminar. These core teachers brought a solidity to the seminar. “We tried to have a consistency of program, but at the same time, continually update topics to be consistent with current knowledge,” Undersander added. It’s still held once a year in different locations, rotating between the West, Midwest, and Northeast. Local instructors are also brought in. “The seminar helps make sure we’re all singing from the same hymnal,” said Dennis Hancock, University of Georgia Extension forage specialist and a current instructor. “Different parts of the country will always have some differences in forage recommendations, but the course helps standardize what can be standardized.” It also allows the experts to update university recommendations or clear up misconceptions. “It’s one of the best parts of this training,” said Meccage of the AITS manual. The one she took home years ago has been used “multiple times when developing Extension training tools. It allows me to have a foundation of resources,” she explained. “I wanted to refresh my foundation in alfalfa,” said Mark Hockel, who attended last fall’s AITS held in St. Paul, Minn. An agronomist and partner in Riverview LLP, based in Morris, Minn., Hockel manages forage production for its dairy and beef. That includes 20,000 acres of alfalfa grown by the partnership or cooperating growers. Last November’s training session exposed Hockel to University of California research results that can help Riverview economically grow alfalfa and use it in rations fed to dairy heifers in a southwestern U.S. expansion. He also learned from AITS Instructor and Michigan State University Forage Specialist, Kim Cassida, of Michigan research showing alfalfa added to grazing mixtures can improve beef cattle rate of gain. Hockel passed that tidbit to Riverview’s beef cattle managers in Nebraska. “They said they were waiting for that kind of information,” the agronomist noted. Hockel enjoyed the diversity of topics that provided a broader grasp of alfalfa, which comes from pulling instructors from different parts of the U.S. This article appeared in the January 2019 issue of Grower on page 10.